Many simple yet profound lessons occur at the National School Games (NSG). For M. Anumanthan, now a 23-year-old professional footballer with Home United and an established Singapore international, the importance of discipline was a much-needed education. 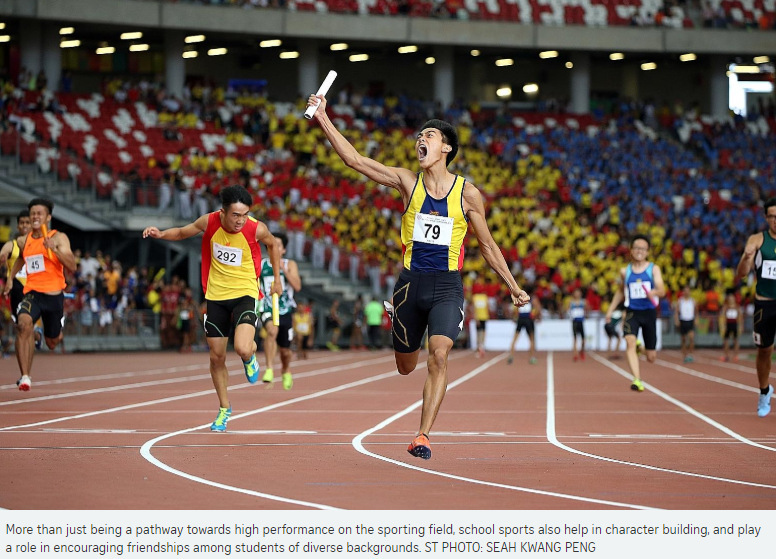 He had the talent but lacked the right character, until his St Gabriel's Secondary School coach Clement Teo intervened and changed Anumanthan's attitude and his life. Anumanthan stopped skipping classes, dedicated himself to fulfilling his football dreams and helped his school to the South Zone B Division title in 2010. "That was when I truly believed in what coach had been constantly telling me to do," Anumanthan said in a previous Straits Times interview. "His advice made me see the right way to go if I was to become a national footballer. "I'm grateful to have had someone to show me the way." Three years later, the midfielder claimed a bronze medal at the 2013 SEA Games and was voted the 2016 S-League Young Player of the Year. Stories like Anumanthan's highlight the role school sports play in the national ecosystem. The NSG, which features participants as young as from Primary 3 all the way to tertiary level, is often where the budding student-athlete is first exposed to a competitive atmosphere and where he or she learns to deal with pressure, the crowd and expectations. Last year's NSG drew more than 58,000 competitors in over 400 events across 29 sports. Through their established development programmes, the likes of St Gabriel's (football), Ahmad Ibrahim Secondary School (shooting) and Anglo-Chinese School (Independent) (water polo) have a long history of identifying and grooming future national athletes. This pipeline has been strengthened in recent years through the launches of the Singapore Sports School in 2004 and the National Youth Sports Institute (NYSI) in 2015. Unlike the Singapore Sport Institute, which focuses on elite-level athletes, the NYSI has coaches, sports scientists, athlete mentors and administrators to help young athletes maximise their potential before they move on to the next stage of their development. More than just a pathway towards high performance on the sporting field, school sports is also a fertile ground for character building. Two instances have stood out in recent years and received widespread praise. During a 2016 A Division boys' football match against Anglo-Chinese Junior College, Raffles Institution's (RI) Jonathan Chua was awarded a penalty after the referee judged that he had been brought down illegally in the box. But the 17-year-old rejected the spot-kick and told the referee that he had simply lost his balance. RI went on to lose the match 1-3. Jonathan was later presented an autographed jersey by Paco Alcacer, who visited Singapore that year with former club Valencia. Alcacer, who now plays for Spanish giants Barcelona, was impressed and said then: "It's true that today it's difficult to find these situations in professional football because there is a lot of pressure for teams. I hope in the future these kind of situations will be something more usual." Earlier this year, the St Andrew's Secondary hockey team were cited for their integrity during the B Division boys' bronze medal play-off. With the score tied at 1-1, and their opponents Northland Secondary unprepared for the restart of the match after an injury stoppage, the Saints were wrongly given possession and scored from that passage of play. The Saints, led by skipper Sean See, asked the umpire to disallow the goal, which she did. They lost the match 4-3 on penalties, with the final score remaining at 1-1. The umpire, Miskarmalia Mohd Ariffin, said she had "never seen anything like this" in her 12 years of umpiring. Sean, speaking at the time, said: "It wasn't the right thing to do, to let the goal be counted, because it wasn't fair." The role of school sports in encouraging friendships among students of diverse backgrounds was touched on by Deputy Prime Minister Tharman Shanmugaratnam during the Majulah Lecture dialogue at Nanyang Technological University last year. He said "our CCAs (co-curricular activities) are too ethnically defined in practice", and called for "deepening multiculturalism" from a young age. Schools ST spoke to said racial mix in certain sports is improving. Dunman Secondary School's four basketball teams are made up of 12 to 15 students, and Chinese students account for only half the players. This is the same experience with swimming, said Outram Secondary School's water polo coach Kuah Kar Huat. There are more Malays and Indians taking up swimming now, compared with the 1980s when it was dominated by Chinese, he added. His B Division team of more than 20 boys now has three Malays and one Indian, while the rest are Chinese. Previously, there was only one non-Chinese swimmer. Coaches play a pivotal part in the growth of student-athletes. They often have to perform a variety of roles - mentor, counsellor, disciplinarian and teacher. It is a big responsibility and, sadly, can occasionally be abused. In February this year, a school basketball coach was sentenced to 10 years' jail for committing sexual acts on his then 13-year-old trainee. Also in that month, school rope-skipping coach Roger Yue Jr was sentenced to 25 years' jail for sexual offences against a student. Following these incidents, national agency Sport Singapore said it would take the lead in ramping up efforts to curb misconduct among coaches. These include discussions about real-life incidents involving physical contact between coaches and their athletes during a compulsory course for over 3,000 coaches in the National Registry of Coaches (NROC). From this year, the Education Ministry also requires all external sports coaches to acquire provisional NROC membership. According to the ministry, schools currently engage about 14,000 instructors and coaches. Former Minster for Education (Schools) Ng Chee Meng announced earlier this year that the inter-primary school sports tournaments will be revamped to increase playing opportunities, as well as to reduce the "perceived stakes" of competitions. These new competitions in the Junior Division - open to pupils aged nine to 11 - will be introduced or piloted in the next three years. For example, a three-tier competition will be introduced for floorball, where the players will be grouped into teams with comparable skills, after an initial classification competition. This year, football tournaments for primary schools will be eight-a-side instead of nine, as both the Football Association of Singapore and the Education Ministry believe this will give boys and girls more time on the ball and a better chance to hone their skills. The Singapore Table Tennis Association also aims to roll out a schools league, which will provide additional opportunities for secondary school teams that do not progress beyond the zonal levels, as well as schools that do not have teams. The goal is a clear one. School sports are a necessary and important tool in cultivating a more-rounded Singaporean community.